Oh, my goodness, it feels so good to post here again! Forgive my long absence. Life has been swiftly moving along, but coupled with that were persistent computer problems that took a while to get fixed. Crossing my fingers, but we're doing good enough for me to photo-edit pics now, and even write a post! Hallelujah! And boy, do I ever have a lot of photo-editing catching-up to do. It'll take me some time, so please bear with me. 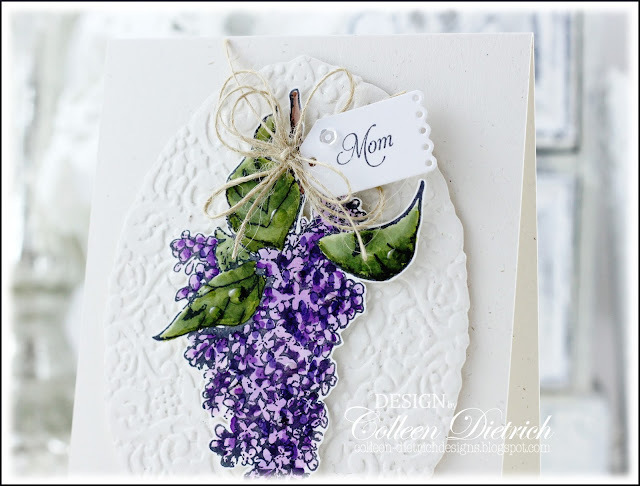 Tonight, I was able to work on these photos of a card I made for Mother's Day. A sweet woman I work with bought it for her mom, who loves lilacs. Her mom loved it, and that makes me so happy! The lilac is from Flourishes' Lilac set, and the sentiment from Papertrey Ink's Tiny Tags set. I stamped the flower, fussy cut it, colored it, and mounted it on a Holiday Frame (Stampin' Up!) embossed oval, which was also fussy-cut. 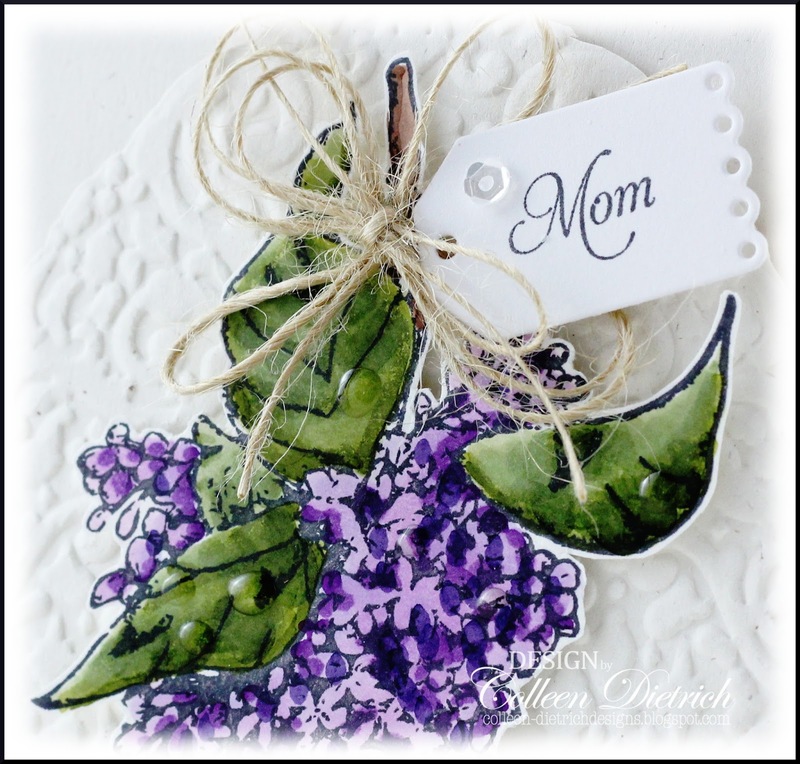 I added a few drops of Glossy Accents to the leaves, and added one sparkly sequin to the sentiment tag. Oh, what joy this one post has brought to my heart tonight! I do hope you have enjoyed stopping by. I'm giving you a virtual hug for coming over!! Stamps: Lilac - Flourishes; Tiny Tags - Papertrey Ink Paper: Naturals Ivory, white, Vintage Cream - Papertrey Ink Ink: Memento Tuxedo Black - Tsukineko Fibers: twine - Creative Impressions Accessories & Tools: Tiny Tags die - Papertrey Ink; Copic markers; Glossy Accents - Ranger; Sparkling Clear sequins - Pretty Pink Posh; Holiday Frame embossing folder - Stampin' Up! Looks gorgeous with the color against the white! Sorry to hear about the computer problems! So frustrating!! LOVING your card!! The lilacs are GORGEOUS!! WOW!!!!! YAY!!! So good to see you back!!! I love this card!!! So simple, so stunning!!! Can't wait to see the rest of your projects....Have a wonderful day and the rest of the week! I thought maybe you'd given up trying to manage the blog and the job at the same time. I know it can be difficult. So glad to hear you haven't left us! This is beautiful and so feminine for Mother's Day. I'll be looking forward to more as you catch up with the photo editing. Welcome back, Colleen! 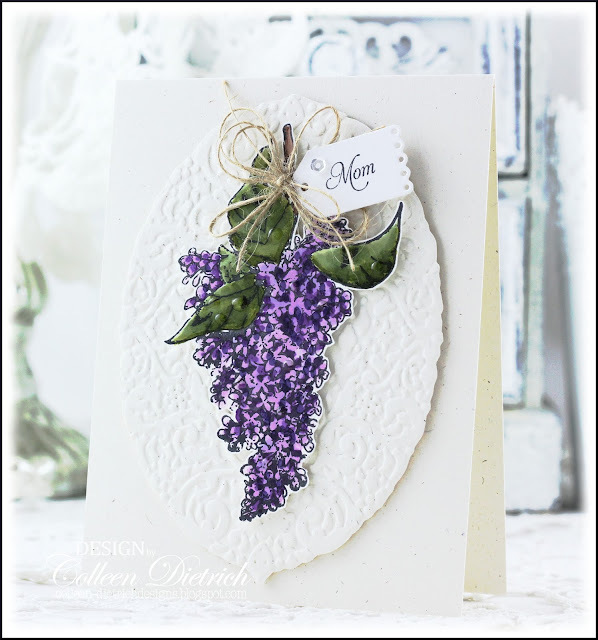 LOVE the GORGEOUS lilacs and the color against the white! FAB card, Colleen! I have enjoyed stopping by, Colleen! Glad your computer is fixed and I look forward to many more posts! Happy 4th of July! Be safe! Hello stranger!!! So nice to see a post from one of my favorite bloggers!! 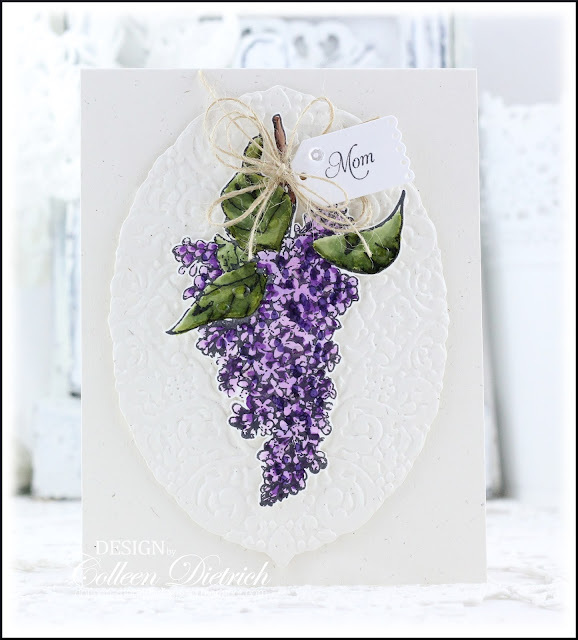 I love lilacs too and this card is GORGEOUS!! I can just smell that perfect fragrance. Happy 4th of July to you and yours.! Enjoy and be safe! !